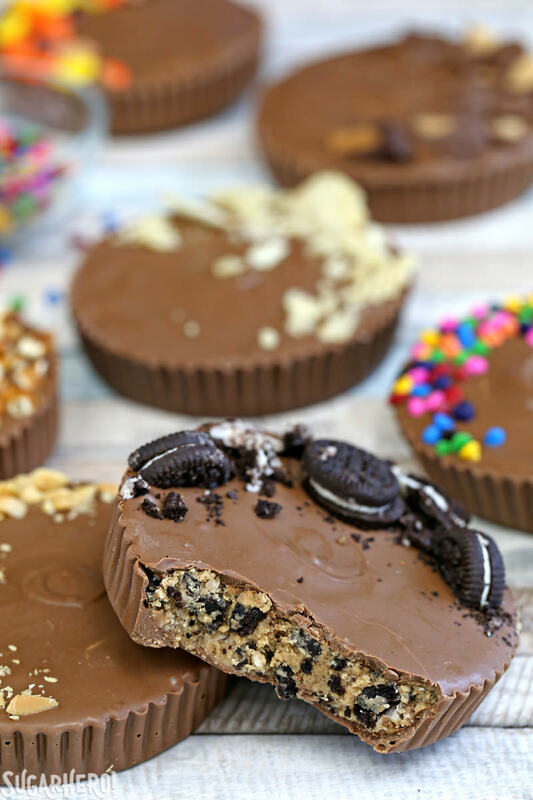 Why have regular peanut butter cups when you can enjoy MEGA Stuffed Peanut Butter Cups?! 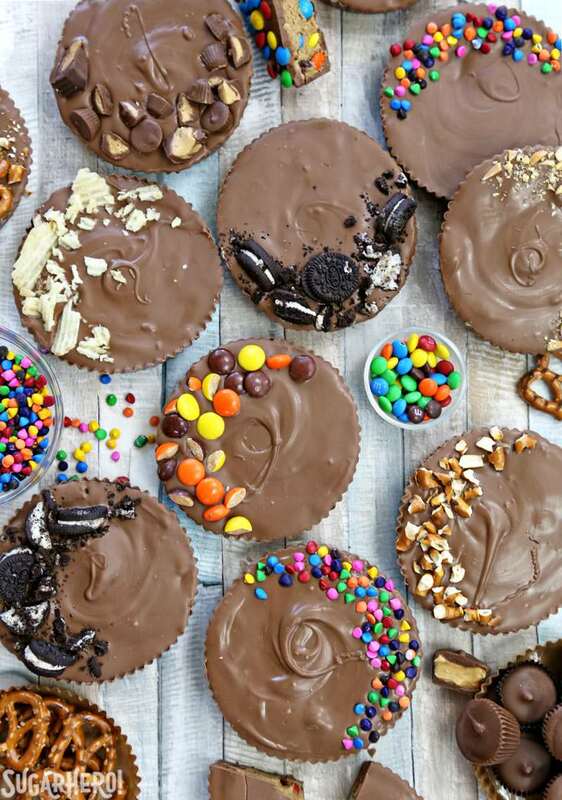 These giant homemade peanut butter cups are filled with cookies, candy pretzels, potato chips, or anything else you can dream up! 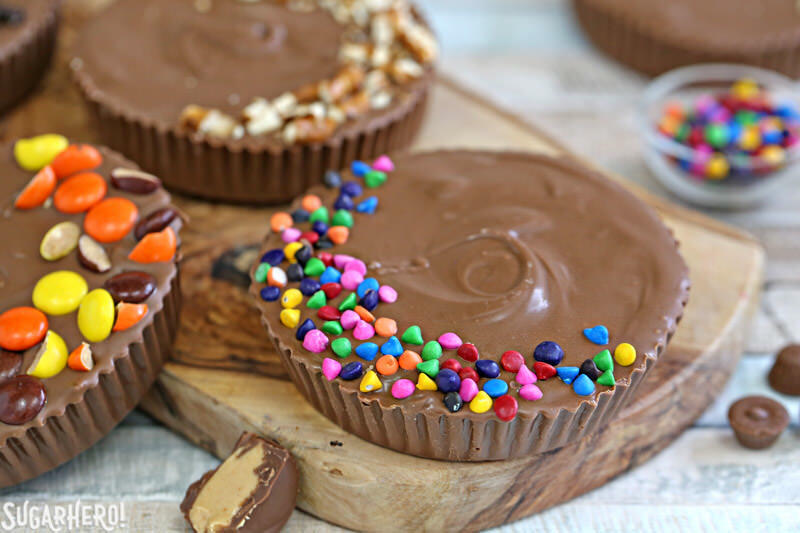 With Halloween this month, I will see your Costco-sized bags of mini peanut butter cups, and raise you these giant, homemade, heart eye emoji-inducing MEGA Stuffed Peanut Butter Cups! Oh, and before we go any further, don’t miss the video showing how to make these peanut butter cups at home! If you’re reading this blog, that means you’re probably my people. And being my people means that we like things big. Over-the-top. (Some folks might even say garish, but those folks are not deserving of our time or our chocolate.) We like to take perfectly reasonable candy, and embiggen it until it covers our entire palm and weighs a quarter of a pound. THAT’S the SugarHero way! So, naturally, with Halloween candy on the brain, I took one of my favorite treats, peanut butter cups, and enlarged them to make a fun jumbo version. I used 4-inch paper cups to mold them (originally intended for caramel apples–they’re easy to find in craft stores like Michael’s or JoAnn’s right now!) and they were the perfect size for crafting mega candies. 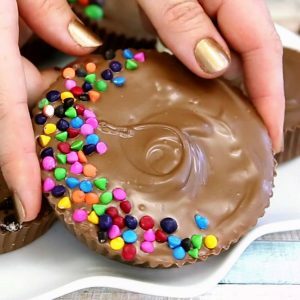 But enlarging peanut butter cups like that can result in a LOT of peanut butter filling. 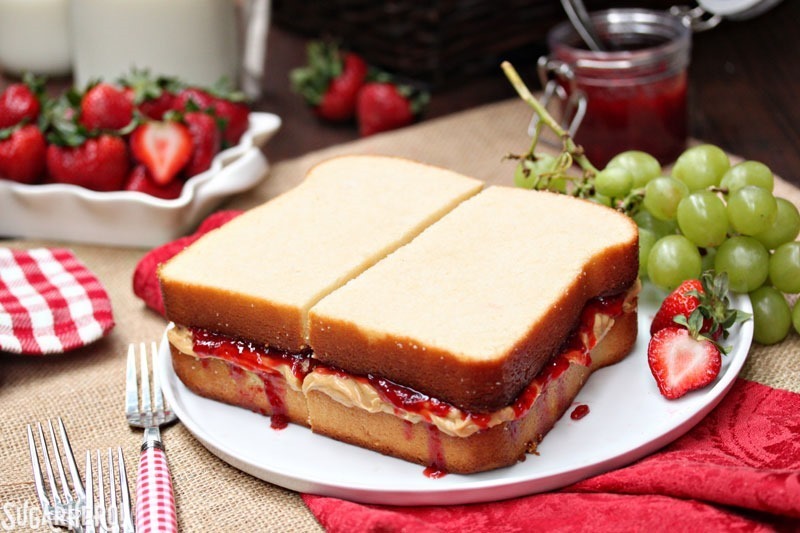 Don’t get me wrong, pb filling is delicious. But I worried it would be overwhelming, or too samey-samey, which is why I stuffed these peanut butter cups with tons of fun mix-ins. After I made the quick + simple peanut butter filling, I divided it into a number of bowls and just stirred the different mix-ins in at the end. Then, once the cups were filled and covered with chocolate, I topped them with a bit of whatever they were filled with, like crushed cookies or chopped pretzels. Not only did it help identify the filling, but they looked so cute, arrayed together on a serving tray! I know I keep saying it, but these cups are BIG. I won’t stop you from eating an entire one yourself, but they’re really intended for sharing. You can cut them into halves, quarters, or do what we did and cut them into small wedges and serve them all together on a sampler platter. This way, everyone gets to try a bunch of different flavors, and no one feels obligated to finish a peanut butter cup the size of their head! I think I got a pretty good variety of pb cup mix-ins, but tell me, what did I forget? What would YOU stuff your peanut butter cups with? 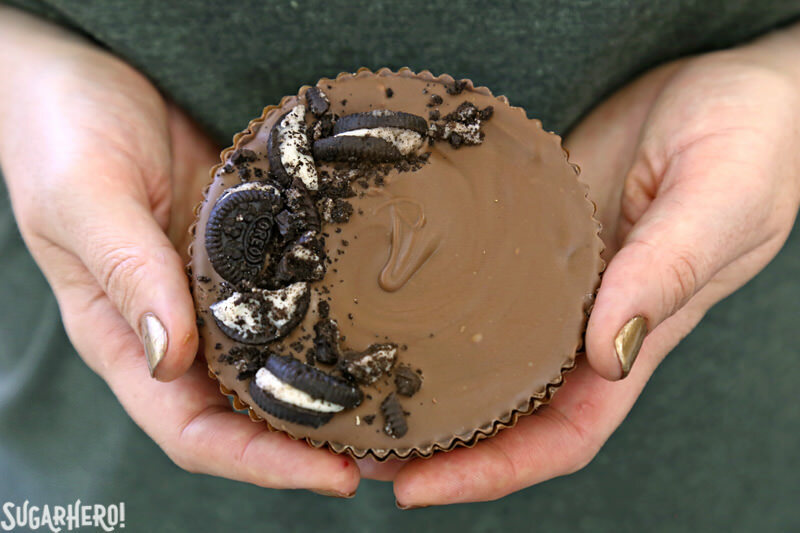 Why have regular peanut butter cups when you can enjoy MEGA Stuffed Peanut Butter Cups?! 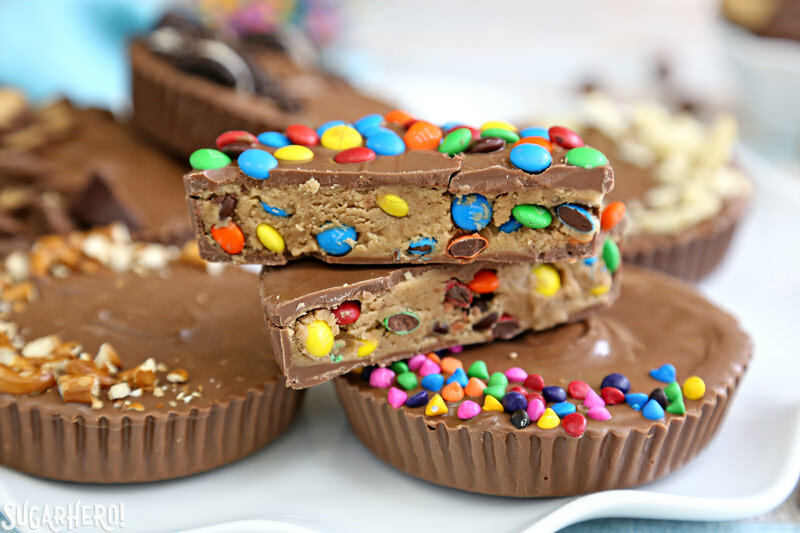 These outrageous jumbo peanut butter cups are filled and topped with your favorite mix-ins, like chopped cookies, pretzels, and crushed potato chips. You can serve them whole, or cut them in wedges so that people can sample lots of different flavors. To mold these peanut butter cups, I used paper cups that were approximately 4 inches wide and ¾-inch tall. (They were originally intended to use with caramel apples.) You can use other sizes of cups—regular cupcake liners and jumbo cupcake liners will both work just fine. If your liners are a different size, your final yield might be different. 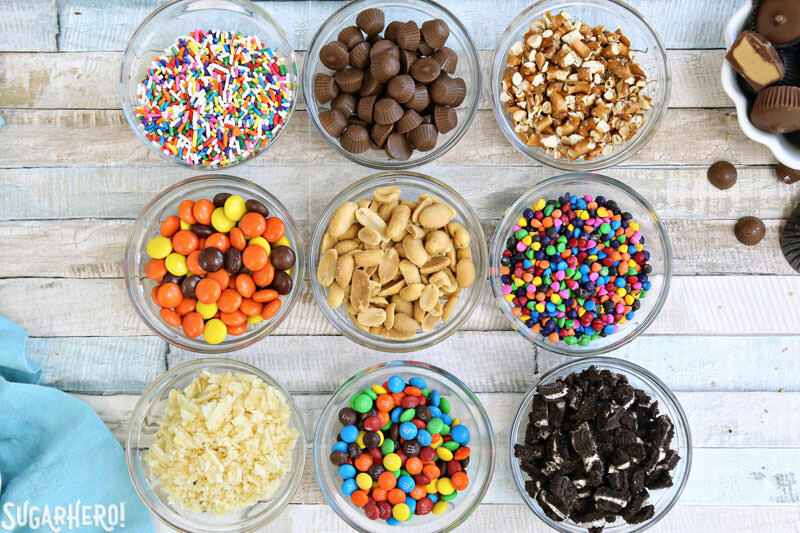 1-2 cups assorted mix-ins: chopped cookies, sprinkles, potato chips, pretzels, or whatever else you’d like! Lay out 9 jumbo paper cups on a baking sheet. Place the chocolate candy coating in a large microwave-safe bowl, and microwave in 30-second increments, stirring after every 30 seconds, until the coating is melted and smooth. Working with two to three cups at a time, spoon a few tablespoons of chocolate into each cup. Use a clean, food-safe paintbrush to brush the chocolate coating up the sides of each cup in a smooth, even layer. Make sure that the sides are completely covered, and that the layer of chocolate is thick and even. Repeat until all of your cups are lined with chocolate--you will have extra chocolate left over for covering the top of the cups. Refrigerate the chocolate shells until they are set, for about 10 minutes. 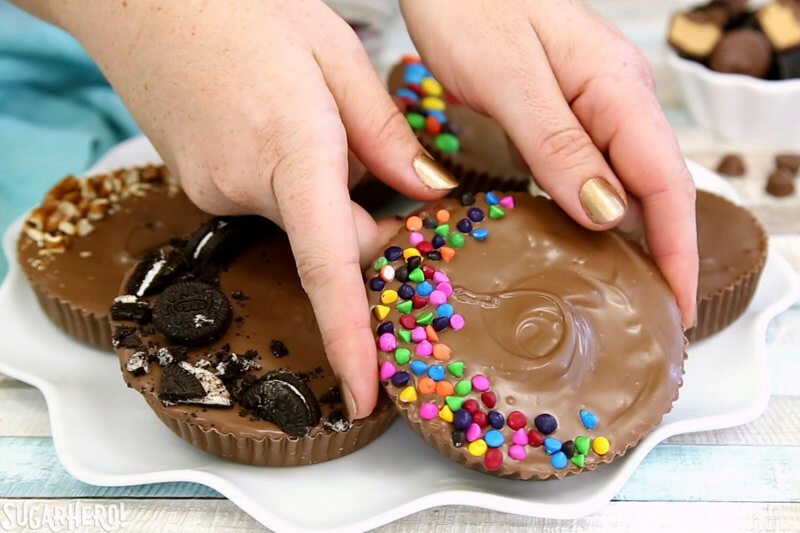 While you wait for the chocolate shells to set, prepare the peanut butter cup filling. Combine the butter, peanut butter, powdered sugar, vanilla, and salt in a large bowl. 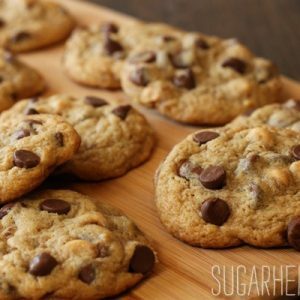 Use a hand mixer or stand mixer to beat them together on medium speed until fluffy and smooth. Stop the mixer, add the milk, and beat on low speed until fully combined and smooth. Finally, add the crushed cookie crumbs, and mix them in. Now for the fun part: the mix-ins! 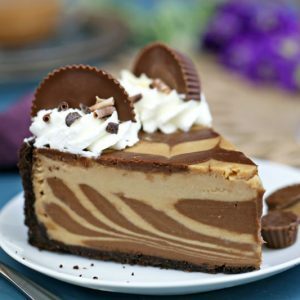 If you’re going to have your peanut butter cups be all the same flavor, you can just stir the mix-ins right into the large bowl of peanut butter cup filling. Otherwise, divide the filling into however many different flavors you want, and stir in your mix-ins. The exact quantity needed depends on the mix-ins, but I found that 1-2 tablespoons per mega peanut butter cup was a good place to start. Once the shells are firm, fill them with the peanut butter mixture. Scoop the filling in and press down lightly with your fingertips to smooth it into an even layer. Leave at least 1/8-inch between the filling and the top of the chocolate cup, so that they can be covered with chocolate. If necessary, re-warm the extra chocolate candy coating in the microwave, until it is fluid and smooth. Spoon a bit of chocolate on the top of each cup and use the back of a spoon to nudge the chocolate over the top, so that it covers all of the peanut butter and forms a tight seal with the sides of the chocolate cup. While the chocolate is still wet, sprinkle the top of the cups with a bit of the mix-in so you can tell what the filling is. Refrigerate the tray to set the chocolate cups completely, for about 15 minutes. For the best taste and texture, serve these cups at room temperature. They can be made in advance and kept in an airtight container in the refrigerator for up to two weeks. YESSSS! These are what dreams are made of. Love the super stuffed filling and pretty little decorations on top! 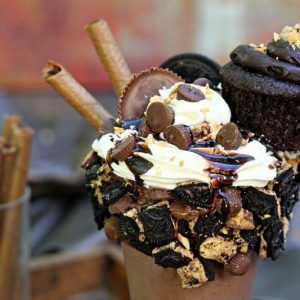 Where do I find the mega sized cups? Oh goodness what would you charge for that! I think I wanna buy it! Where can I find the jumbo cups?? Where do you find the little colorful coated candies that look like mini chocolate chips? I’ve been looking for those everywhere! What are they called?